The final book in the Riftwar Cycle. It is thirty years and more than thirty books since the publication of MAGICIAN, the fantasy classic that enchanted readers and propelled Raymond E. Feist to international acclaim. Now it will all end. 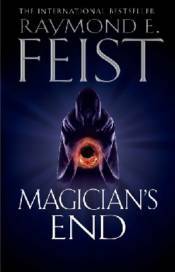 In MAGICIAN'S END Raymond E. Feist brings his much loved series to a stunning and epic conclusion. Readers will finally discover the fate of the original black Magician, Pug, and his friends. Will they survive? Or will someone die? One of the best-selling fantasy authors worldwide, Raymond E. Feist is without doubt the grand master of magic and epic adventure.